This romantic hotel is situated in the national monument/museum the golden fort of Jaisalmer, on the rampart in the beautiful bastion out of ninety nine bastions of the fort, which has been converted in to the guest house keeping its originality intact , heritage building is claimed to be more than 450 years old one, constructed with classic pre-casted , pre-fabricated and rich-carved golden yellow stones, experience the musty historic appeal that oozes out of the ethnic haveli walls during your stay at this jaisalmer traditional house, it is simple and classic , which offers you a real taste of/reflection of golden jaisalmer architect , each lovely beautiful room built with thought full of appointments and comfort. Originality of haveli has been kept intact with original walls, pillars , arches design and carving . 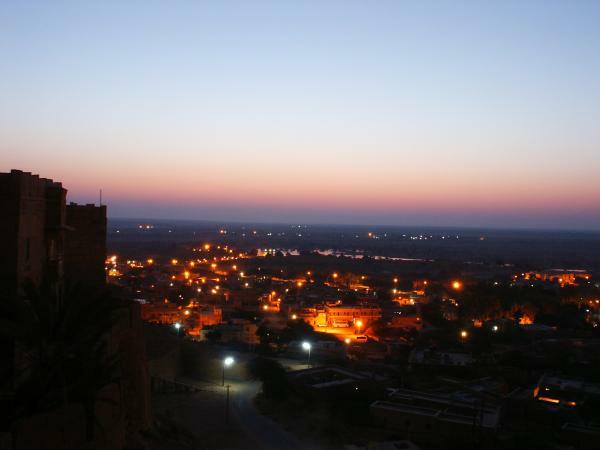 Ideally located in the famous Jaisalmer fort of India on the fortress(boundary walls) it selfat its highest altitude, resulting - its roof top , room windows and balconies provide acclaimed views of Gadisar Lake, sun rise, sun set, jain temples, palace, town side, cross-country , , . They have long experience of managing safe, comfortable and memorable jeep tours/ camel safari/desert camp with rajasthani celebrated folk music and dances around a camp fire on starlit evenings at the sand dunes deep in to the desert through their expert camels and own camel men, their charge are very much reasonable with respect to services they provide , they provide food, fruits, water, breakfast, etc very much delicious hygienic and ample in quantity as well as good tents, beds/blankets to keep you warm in the desert nights..
lonely planet guide book has narrated* this is laid back place in a lovely reputedly haunted old haveli**. 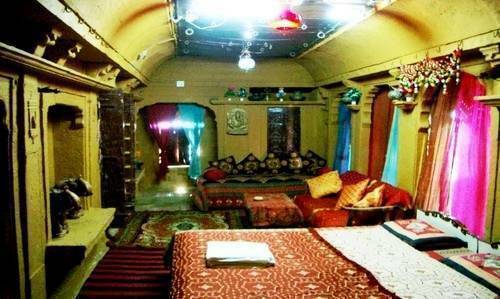 even though it is old building but all modern facilities have been provided , like attached bath with hot/cold water round the clock , charming wooden beds, carpets, traditional printed fabric curtains and antiques to keep its original look. A popular name for managing a trip to the desert called camel safari. Doctor on call round the clock . Railway, bus and air ticketing facilities. to accept all types of visa cards. 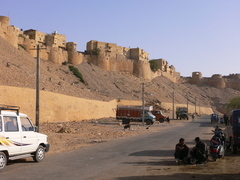 this heritage building is a part of the national monument/museum, world`s main attraction the golden fort of jaisalmer .. it is in the heart area/near world famous jain temples campus.